If you want to do DevOps, you have to constantly deliver value to your customers and gather evidence of the success in production. This means constant, zero downtime deployments and testing new features with smaller sets of customers (A/B testing, canary releasing). To achieve this, you have to decouple the feature roll out from your code deployments. This is done by a design pattern that is called feature toggle, feature switch or feature flag. Originally it was called feature toggle because of its Boolean nature. With A/B testing and canary releasing the “toggles” became more complex. So today the term “feature flag” is more common. or a mix of the above. This is really powerful, because you can develop long term features inside the master branch and release them when you are ready. But it is also dangerous, because you have to maintain the compatibility between your features on all levels (persistence, UI etc.) and the complexity to test all runtime alternatives may increase dramatically. Implementing a framework that meets these requirements is pretty complex. There are a lot of open source frameworks for the different languages. For Java there are Togglz, FF4J, Fitchy and Flip. For .Net there are FeatureSwitcher, NFeature, FlipIt, FeatureToggle or FeatureBee. Some use strings, some enums and some classes – but none has a high scalable backend and a portal to manage your flags (at least not that I know). If you start with feature flags the chance is high, that it gets really complex after some time. So when Jim Bird writes that Feature Toggles are one of the Worst Kinds of Technical Debt, it is for a reason. So how do you use feature flags “the right way”? The first thing is, that not all feature flags are the same and you should not treat them that way. There are short-lived feature flags, that are used to roll out new features or conduct experiments. They live for some time and then go away. But there are also feature flags that are intended to stay – like flags that handle licensing (like advanced features etc.). And there are mid-term flags for major features that take a long time to develop. So the first thing to do is to create a naming convention for the flags. You may prefix your flag names with short-, temp-, mid- or something like that. So everyone knows, how the flag is intended to be used. Make sure to use meaningful names – especially for the long-lived flags – and manage them together with a long description in a central place. Mid and long term flags should be applied on a pretty high level. Like bootstrapping your application or switching between micro services. If you find a mid or long term flag in a low level component you can bet this is technical debt. Short term flags are different. They may need to reside on different levels and are therefore more complex to handle. It is a good idea is to use special branches to manage the cleanup of flags. So right when you introduce a new feature flag, you create a cleanup branch that removes all the flags and submit a pull request for it. If you do DevOps, then you probably already do some kind of feature flags. You should build a strategy to do feature flags right to not end in chaos. Pick a good framework and build a scalable, manageable and extendable engineering system around it. 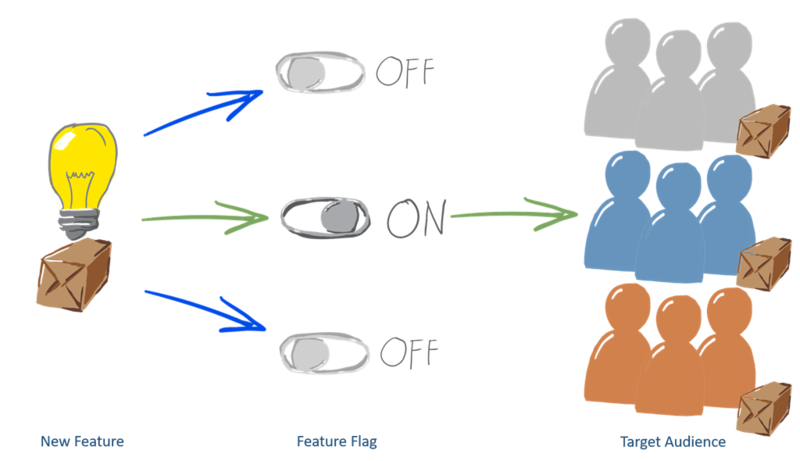 Done right, feature flags are one of the most powerful patterns for DevOps. So take your time and do it right!